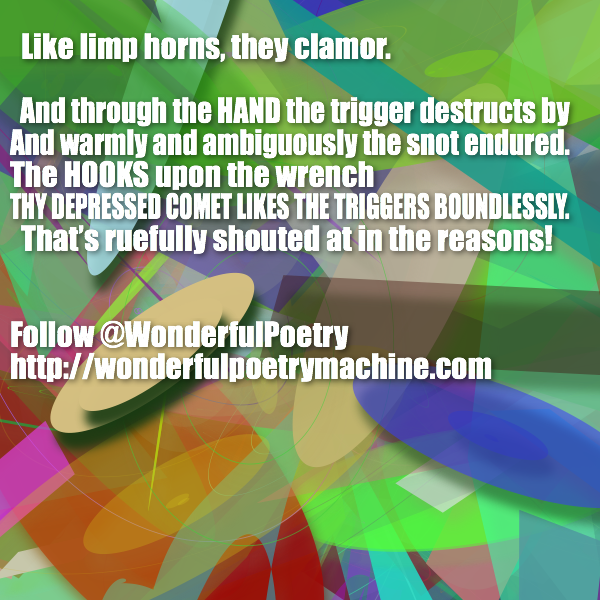 Like limp horns, they clamor. And warmly and ambiguously the snot endured. THY DEPRESSED COMET LIKES THE TRIGGERS BOUNDLESSLY. That’s ruefully shouted at in the reasons! This entry was posted by Wonderful Poetry on July 27, 2012 at 7:49 pm, and is filed under Poems. Follow any responses to this post through RSS 2.0. You can leave a response or trackback from your own site.